Jared Kushner's application for a top-secret clearance was rejected by two career White House security specialists after an FBI background check raised concerns about potential foreign influence on him — but their supervisor overruled the recommendation and approved the clearance, two sources familiar with the matter told NBC News. After Kline overruled the White House security specialists and recommended Kushner for a top-secret clearance, Kushner's file then went to the CIA for a ruling on SCI. After reviewing the file, CIA officers who make clearance decisions balked, two of the people familiar with the matter said. One called over to the White House security division, wondering how Kushner got even a top-secret clearance, the sources said. Top-secret information is defined as material that would cause "exceptionally grave damage" to national security if disclosed to adversaries. 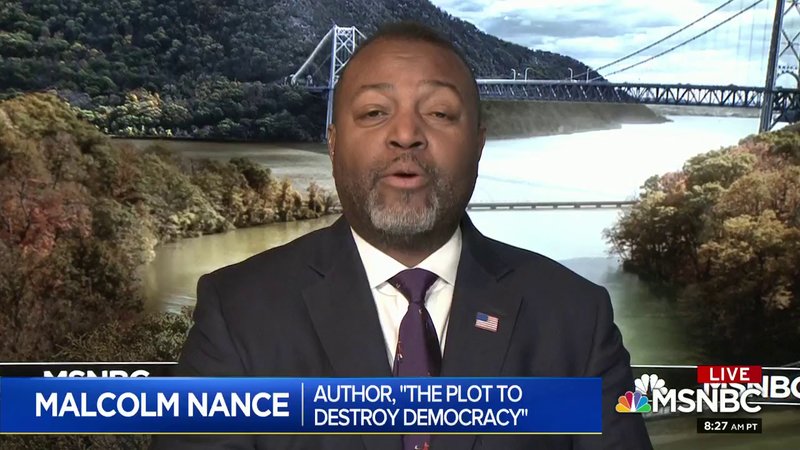 Former intelligence officer Malcolm Nance laid out plainly just what the worst case scenario we may be dealing with on this Saturday's AM Joy, which terrified host Joy-Ann Reid, and hoped that the House is ready to "rip this thing apart" a.s.a.p. NANCE: I'll tell you, I held a top secret SCI security clearance with special access programs. Jared Kushner would have many, many higher levels access of that if he is working in the office of the president. The security concern is quite simple and I have never heard of a person ever editing their actual SF-86 security application form, like Jared Kushner did with, I believe over 100 modifications to it. That's because anyone who modified their clearance of application once, had their clearance pulled and never given access. Also Jared Kushner, one of the concerns that FBI had, was at the point where they were going to adjudicate his process, they had come up with the term unclearable. I had never heard of this term unclearable. That means that there is something in your background, whether it's -- usually financial in your contacts with foreign powers. That means that you are a national security -- potential national security threat to the United States. This is why the CIA would not allow Jared Kushner access to their programs. Because that means that he would either -- they suspected he would either give away top secret information, sell top secret information, or would compromise their intelligence operations. MCQUADE: I think so, and not just merely to look at whether, you know, Jared Kushner made false statements on his clearance forms, background forms, or are at risk of some sort of security concern, but whether this is all part of the same conspiracy. We wanted people to have access to this information so that it could be shared with Russia as all, as part of this conspiracy, that in exchange for assisting the president and becoming elected, there were certain quid pro quos they would get in exchange, one of which may have been the sharing of classified information. So I think it absolutely fits within the scope of that investigation and so why -- you know, Carl Kline, it's a legitimate question to ask him, why did you overrule the opinions of career intelligence professionals 30 times in this administration? I think that's a fair question. REID: Oh, my goodness. Well, in the words of cyber security professional Adam Levin, scaring is caring, but you're terrifying me right now. Malcolm Nance, sharing information or selling information is sort of a worse case scenario. We know Jared sought a back channel with Russia. There are headlines about how he would WhatsApp with MBS, with the Saudi crown prince. This is actually quite alarming. NANCE: It is, and you know there's an additional point that I'm going to terrify you with right now. The counterintelligence professionals who are making these determinations that people shouldn't have it, are now going to, or have probably thought about this individual, Mr. Kline, to determine, was he allowing a network to set up within the White House, was he himself either influenced by a hostile foreign power, or influenced by a political preference within the White House and allowing these unclearable individuals to come in there, to set up like I said, a network where they could be compromising the national security of the United States. If I was in counterintelligence at the FBI and definitely at the CIA, I would be pulling my hair out right now because we all know Jared Kushner, as you mentioned in the previous segment, asked a foreign power to use foreign cryptographic communication systems, so he could speak behind the back of the United States government. You know what, the House needs to rip this thing apart, because I think that what we're going to find is, individuals for their own personal benefit may have been using this information that they were given access to that they should never have ever seen.